PhoneWorld converts your landlines and Mobile to VoIP. The change to IP telecommunication infrastructure is gradually taking place worldwide. Switzerland is modernizing its telephone system by going all IP. Traditional landline (analog & ISDN) has reached the end of its service time. An all-IP system provides the technical basis for the digitization of communication within Switzerland and thus secures the country as a future-oriented, attractive business location. Needless to say, there are no alternatives and customers have no options other than to update their current systems to allow Voice over IP (VoIP). Monthly Base Charges: Considerable savings will be made by eliminating previous subscription charges levied on analog/ISDN connections by traditional carriers. However, this will partly be offset by IP license charge. Calling Rates: VoIP rates are the same as current ISDN. However, substantial savings are generated through calls between network customers which are at no cost (fixed to mobile, fixed to fixed, mobile to mobile, mobile to fixed). Additionally, there are considerable savings in making VoIP calls via your mobile phone (irrespective of mobile network), even in a non-WiFi environment (data costs less than voice). View worldwide calling rates for IPcalls pdf (landline and IPCall mobile). Note: PhoneWorld VoIP completely eliminates the cost of international roaming charges via the IPCall App. The VoIP service area becomes virtualized without geographical limit. That is, the area code or country code is no longer bound to a specific location. For example, you could travel to Australia and use your Swiss VoIP number down-under. The calls from Australia become in fact domestic Swiss calls, even though you are physically in Australia. Wherever the phone goes, the same services are available: call features, voicemail access, call logs, security features, service policy, etc. All you need is internet access. VoIP protocols run on the application layer and are able to integrate or collaborate with other applications such as e-mail, web browser, instant messenger and social-networking applications. This integration and collaboration creates synergies and provides valuable services to end users. Typical examples are voicemail delivery via email, click-to-call service on a website, voice call button on an email, etc. Legacy phone systems (analog & ISDN) assigned dedicated phone numbers which often had to be changed after moving. However, VoIP numbers provide total mobility. VoIP numbers go with you as long as you have an Internet connection. This is especially convenient and cost effective for international travellers using the IPCall Mobile app. VoIP customers can take their current analog/ISDN numbers along. Conventional telephone numbers can be easily ported to the new VoIP technology. Therefore, there is no change in your current phone number vis-a-vis third parties. Mobile numbers cannot be ported into the VoIP system. 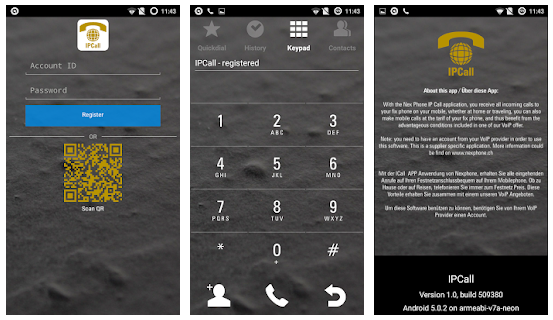 Only landline numbers can be ported (PhoneWorld, Swisscom, Sunrise, etc.). There is no need to subscribe to expensive TV subscription packages which is offered by carriers and cable operators. One of the most cost efficient ways to watch programs on your TV, PC, tablet or smartphone is Zattoo. PhoneWorld is providing an "IPCall Mobile" application which can be downloaded on your Swiss mobile phone (Swisscom, Sunrise, Salt, TalkTalk, etc.). The new app provides you with the opportunity to call domestic and worldwide at the same low VoIP landline rates. Further, with a PhoneWorld VoIP connection the IPCall Mobile app allows you to receive and make calls from anywhere in the world and benefit from local Swiss pricing. There is no charge for VoIP calls between network members, whether using landline or mobile phones. All incoming calls to your registered landline phone will also be received on your mobile via the app. In a larger office environment this also means you have to link your DID number (direct inward dial) to your mobile phone number. Via settings, you can turn 'Push Notifications' "off". Thus the mobile phone ringing will stop. Complete the Power of Attorney form (VoIP Application: English - French). This will port your landline number to PhoneWorld VoIP. Customers currently subscribing to a TV package with cable operators etc. will be provided with a VoIP number which is independent of such installation. With our IPCall application, any call to your landline will ring through to your mobile, wherever you are in the world. Consider your mobile becoming an extension of your landline for making or receiving calls worldwide. Your recipient will see your landline phone number when you call from the IPCall app. The IPCall app will recognize your QR code and complete the installation and configuration (auto log-in). Consider the PhoneWorld IPCall service an extension of a Swiss landline. Make and receive calls from anywhere in the world and benefit from low Swiss landline prices. IP calling is cost effective. It eliminates all roaming charges. You can even record your conversations. If you receive a call to your IPCall phone number when you are away from home, you will still receive the call. The system will re-route the call automatically via normal 4G networks and you will pay only for data usage. Security: The IP call mobile system is based on a Swiss landline connection. It is exactly the same as if you were using your home/office fixnet. Thus itis NOT an unsecured connection like experienced with social media or most other IP dialing systems. (VoIP Application: English - French). Please complete and sign this form, then scan and email to connect@phoneworld.com. Upon receipt, PhoneWorld will contact you to establish technical requirements (adaptation to VoIP). Residences and home offices are equally affected by the move to VoIP. PhoneWorld has the technology to migrate your phone to VoIP via providing a special voice/data modem (VDSL or fiber optic). The new technology also allows PhoneWorld residential customers to make calls on their mobile phone (any smart phone) via an IPCall application as outlined above. Authorization form to transfer and port your current landline to PhoneWorld VoIP. which most WLANs use today. That's why they are commonly used interchangeably. Wi-Fi as a name for the standard is a trademark of the Wi-Fi Alliance.